This is an amazing amazing book! It has quickly become my new favorite. There are no projects in it. How can a quilting book with no projects be any good? Well, I'm going to try to explain. C. June Barnes has written Exploring Dimensional Quilt Art in order to push the current boundaries of our two dimensional thinking. Yes, some of us add texture to the surface of our quilts, but June wants us to think of quilting as a totally three dimensional possibility. Have I ever mentioned how much I hate math? 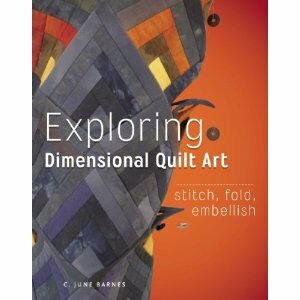 Well, Exploring Dimensional Quilt Art has got me rethinking that. Simple (and at times not so simple) geometry stands behind a lot of June's amazing quilted pieces. June starts with surface manipulations, which many of us are familiar with, but I'm going to bet that most of us have never tried the ones she shares! She then moves on through manipulating and rearranging the plane of the piece into woven, folded, gathered, spiraled, curled, wrapped, twisted, and stacked layers. From there, you'll explore three dimensional shapes and pieced constructions like squares, circles, pyramids, crescents, and all sorts of Platonic and Archimedean solids. The math is doable, for the most part, with an appendix to help you. I have already been inspired to create two different pieces because of this book. I made a little felt pyramid to which I added beads, and a bracelet inspired by the mobius strip. This is not a beginner's book: you will not be told how to quilt. But you will be told about all kinds of wonderful products to try in order to add strength and structure to your creations. June discusses everything from interfacing to armatures in the first part of the book, and then throughout as different showcased pieces bring new challenges for proper presentation. This book is really primarily an inspirational work: June introduces a new concept and points out beautiful quilted pieces that illustrate the point. The unbelievable beauty of her work and of the artists she includes is just breath-taking. I love these kinds of books! This way you have to think things through and it gets your creative juices flowing as you ask "what if?" I know they are not everyone's preference, we all learn things differently, but I love a challenge and this presses all my buttons. Play time! Me too. Every page got my head spinning...not with thoughts of "oh I have to make one of those" but more like "oh I need to use that technique in this project I've already been thinking about"!